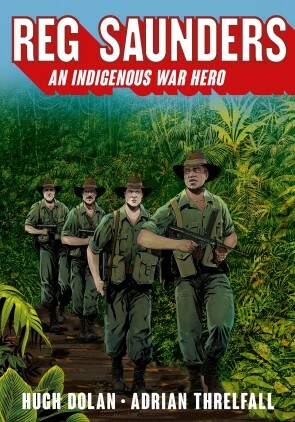 The little-known story of Reg Saunders, the first Indigenous Australian to become an officer in the Army, retold in action-packed graphic format. Reg Saunders MBE (1920–90) not only survived the World War II battlefields in the Middle East, North Africa, Greece, Crete and New Guinea, but excelled as a military leader. He was recommended for officer training and, in 1944, returned to New Guinea as a platoon commander – the first Aboriginal Australian to serve as a commissioned officer. What happened during the war to transform a determined young man from country Victoria into a war hero – one who would go on to serve with distinction in the Korean War, and become a pioneering figure for Indigenous rights? Winner, 2015 Educational Publishing Award in the Secondary Student Resource – Junior category. A review in the Age by Jacqui Taffel. A review in the NewDaily. Interview on Late Night Live with Hugh, Adrian and Reg’s daughter, Glenda Humes. HUGH DOLAN is a former intelligence officer with the Royal Australian Air Force. He is the creator of a series of historical graphic novels, including Gallipoli: The Landing (2014) and Reg Saunders: An Indigenous War Hero (2015), and the author of 36 Days: The untold story behind the Gallipoli landings (2010). The documentary film Gallipoli From Above (2012), which Hugh presented, was based on material from his book and screened on both The History Channel and ABC TV. Hugh’s next book Ned Kelly: The man behind the mask will be published in 2016 by NewSouth. ADRIAN THRELFALL is a lecturer in history at Victoria University, Melbourne, and a member of the education team at the Shrine of Remembrance, Victoria. A former infantryman in the Australian Army Reserve, he is the author of Reg Saunders: An Indigenous War Hero (2015) and Jungle Warriors (2014), which explores Australia’s role in jungle warfare in World War II.